Gold and the QE3 Ship …are Both About to Sail? Back in Mid-May of this year we had a big rally in the Dollar and Gold was correcting hard. There was a bit of Dollar Bull hysteria at the time which I felt was quite unfounded. 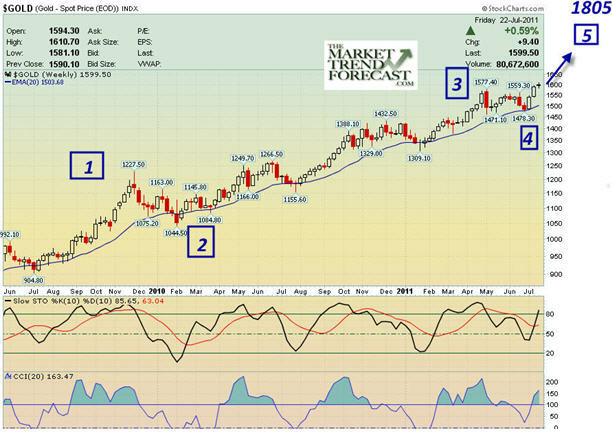 I wrote an article entitled, "The Dollar Bull Monkey Dance Will Soon End Badly, QE3 Next?" You see, the collective herd psychology at that time, just a short ten weeks ago, was that Gold would drop hard at the end of QE2, and The Dollar would of course rally as high as 82, maybe more against the weighted index. The dollar has dropped hard since mid-May as I expected and Gold has continued to rally as well. I had forecasted $1627 for Gold back when we were under $1,500 and last Friday we closed at $1627 on the nose! During the mid-May time, most disagreed with my QE3 forecast, and probably still do but I think the ships is soon leaving port. This could blast Gold up to a target of $1805 on the high end and certainly into the low 1700's to the $1730 per ounce range. Gold has had a powerful 5 wave rally (Elliott Wave Theory) since the October 2008 lows of $681 per ounce, and certainly one could argue that a correction would make sense fairly soon. However, the fundamentals for Gold are only getting stronger as we have inflation climbing at an 8-9% real rate and interest rates continuing to drop. This is creating a "negative" real interest rate environment amidst a continuing weaker US dollar. Hence it is hard fundamentally to argue against Gold at this time, creating difficulty in forecasting the intermediate highs and lows. With that said, assuming QE3 or some form takes place soon then my $1805 target is quite likely to be hit before we can look for any meaningful correction in the precious metal complex. With the ISM manufacturing index turning down sharply as reported this morning and other economic indicators and GDP report rolling over, a QE3 ship horn is likely to sound soon. Below is my latest chart dated July 22nd with Gold at $1599 at the time, outlining the likely interim moves in Gold using my crowd behavioral methodology that I employ at my forecasting service.